Lets help the ones in need with " WeCare "
At PolicyX.com, we believe that good deed starts at home. While catering to your insurance requirements through a host of different plans and policies, we also ensure that whenever you decide to buy from us, we make a contribution towards care, upkeep and education of the underprivileged children in our society. Through power of giving, we foster connections between our customers and the underprivileged children while enduring new forms of support for the cause. When you decide to buy from us by choosing from across many policies under our Health, Auto, Term/Life, Home insurance categories among others, you are playing a part in ensuring that the ones in need get the benefit of quality life that every child deserves regardless of the class and society that they belong to. This is how it happens. A percentage of our premium goes in the welfare fund that we have created for helping and assisting underprivileged children, towards getting better education. Just so that you don’t have any doubts, let us assure you that we do not charge a penny more and paying the exact same amount as you would pay if you were to buy directly from insurance company. 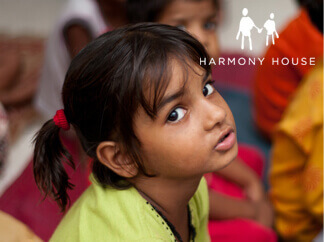 "As one person, I cannot the change the world but I can change the world of one person"
For this noble cause, we have partnered with Harmony House as we believe in giving back to the society. Ever since our inception, we as a responsible corporate organization, wanted to fulfill the needs of the underprivileged and disadvantaged sections of the society and who better to help than the children who are going to be our future growth accelerators. We want to thank you for associating with us in this noble cause and contributing your bit towards the overallwelfare of the children. We request you to spread the message within your friends and peers so that we are able to help and sustain more such underprivileged children in ensuring a better future for them. Because- We Care.